In addition to solving systems of equations algebraically, you can also solve them graphically. A graphic solution can be done by hand (on graph paper), or with the use of a graphing calculator. 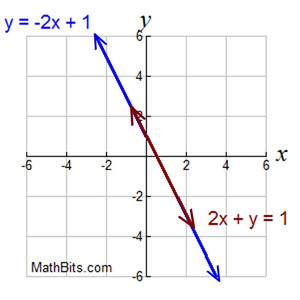 Graphing a system of linear equations is as simple as graphing two straight lines. When the lines are graphed, the solution will be the (x,y) ordered pair where the two lines intersect (cross). * Before you begin, rearrange the equations so they will read "y =". This process will make it easier to read the slope and y-intercept, for the slope-intercept method of graphing. 1. The equations in this example are already set equal to "y". Identify the slope and y-intercept in each equation. Remember: y = mx + b, where m = slope and b = y-intercept. This example used the slope-intercept method of graphing straight lines. The b-value tells you where the line crosses the y-axis. The slope, m, tells you the rise over the run. If you need help graphing lines, see Graphing Linear Equations. Find the intersection point (where the lines cross). These lines cross at the point (2,5). Solution: x = 2 and y = 5. 3. CHECK: Substitute x = 2 and y = 5 into BOTH of the original equations. If your solutions are correct, both equations will be true! 1. Set the equations equal to y to make graphing easier. 2. Identify the slope and y-intercept in each equation. These lines cross at the point (-2,-3). x = -2 and y = -3. 4. CHECK: Substitute x = -2 and y = -3 into BOTH of the original equations. If your solutions are correct, both equations will be true! The graphing method on graph paper can be useful when the intersection point happens to have integer coordinates (as seen in the example above). It becomes less helpful, however, when the coordinates are not integers. If it appears that the intersection point does not lie on the intersection of the grids of the graph paper, try an algebraic solution method or grab your graphing calculator. When using the graphing calculator, you will still need to set the equations equal to y before you begin. Follow the link at the right to see how to use your graphing calculator.